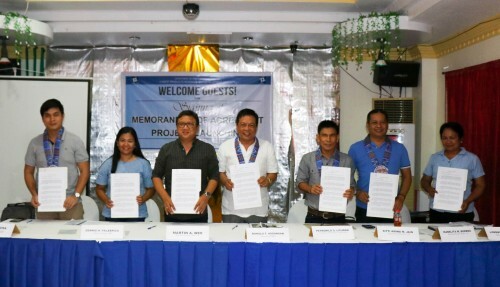 The DOST-Forest Products Research and Development Institute (DOST-FPRDI) recently teamed up with government and private groups to push for the optimal use of old rubberwood trees in Zamboanga Sibugay. Representatives of the DOST-FPRDI, DOST-IX, Tambanan Agrarian Reform Beneficiaries Cooperative (TARBEMCO) and other regional stakeholders gathered last 21 March 2018 for the launch of the project “Processing and Utilization of Senile and Unproductive Rubberwood (Heveabraziliensis) Trees for the Production of High Value Furniture, Mouldings and Joineries”. This 3-year initiative costs Php 57 million and is funded by the DOST- Philippine Council for Industry, Energy and Emerging Technology Research and Development. In the Philippines, senile rubberwood trees are used for making low-value products such as fuelwood, pallets and crates. In Malaysia, Thailand and Indonesia, however, the material is made into higher value items: housewares, housing components and composite boards. With 210 hectares of old rubberwood trees, TARBEMCO plantations are expected to yield 31,500 cubic meters of valuable lumber. After the event, the stakeholders visited the newly renovated TARBEMCO building (photo above) in Brgy. Tambanan, Naga, Zamboanga Sibugay, which will house the rubberwood processing facilities. Newly purchased mobile sawmill and various woodworking equipment were also presented to the team.